Star Wars: Battlefront II, as of today (June 6), has just received free DLC by way of a content drop titled “The Han Solo Season.” More or less, Battlefront II, following the loot box and game balancing fiasco that has lingered over the game since its launch last November, has entered its second season. In doing so, the game hopes to win back players with fixed progression and far less loot box gouging, and to sweeten the deal, season two is welcoming the locations, weapons and characters of Solo: A Star Wars Story to the core Battlefront II multiplayer experience. In the reveal trailer for season two, new maps (Coaxium Mine and Jabba’s Palace) directly inspired by Solo are shown, alongside similarly themed weapons and the ability to play as Alden Ehrenreich’s Han Solo, Donald Glover’s Lando Calrissian and Joonas Suotamo’s Chewbacca. In all honesty, Chewie looks the exact same, but the rendering of Glover and Ehrenreich reaches some uncanny valley-level quality. In addition to the new hero appearances and maps/weapons, new modes are shown as well: Hero Showdown, Extraction and Starfighter Arcade. Finally, Lando’s (and then Han’s) Millennium Falcon, in all of its sleek and clean glory, is now a usable starfighter. 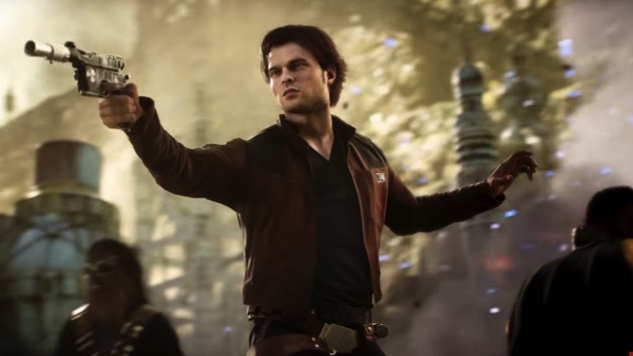 Battlefront II’s “Han Solo Season” has begun, as the DLC is now available, for free, to all players. Check out the aforementioned trailer below for a better look as to the content players can expect from the season two update.